We’re here to help! Connect with our Admissions Team, come for a visit, or follow us on social media. 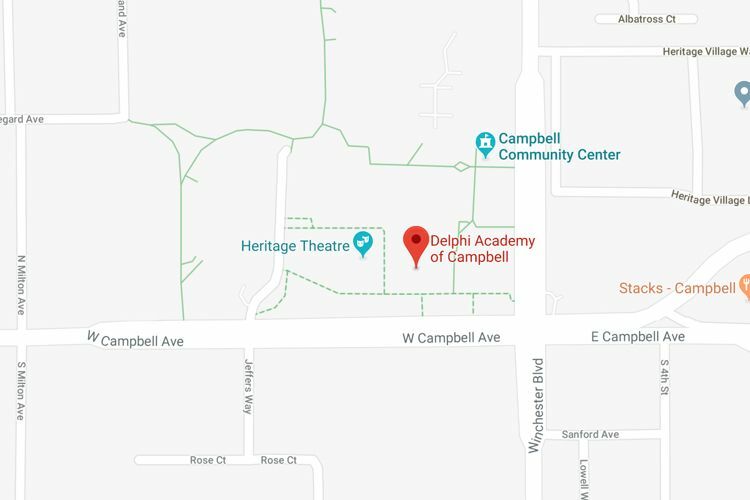 Delphi Academy is located in Building A at One West Campbell Ave. in Campbell. We encourage you to set up a tour of the school during a weekday so you can observe classes in session. Schedule a tour by contacting our Head of Admissions, Maria Agrillo. Even a short visit can go a long way in deciding what school is the right fit for your child and family. Delphi Academy offers several ways to get to know our school, staff, campus and educational program. Open House events are free with RSVP and held on select Saturdays in November, January and March. Children are welcome. Meet the teachers, visit the classrooms and view our materials and curriculum. Light refreshments are served. The Kindergarten Readiness class is a free morning class for children ages 3-5 with their parents. Space is limited, so an RSVP is required. Experience a taste of Kindergarten at Delphi and enjoy beginning reading, math, art and story time. Classes are usually held on select Saturday mornings in February, April, June and December. A School Tour is for parents only and given to one family at a time. See the classrooms in action and understand the Delphi philosophy. As the first step of the Admissions process, this is a great opportunity to get all your questions answered one-on-one with an Admissions Director and talk about your goals for your child. Following a School Tour, parents can schedule a Visiting Day for their child to spend a day at Delphi in the classroom and give it a try. They’ll have a student buddy and meet with Standards for an academic assessment. Evaluation results are provided to parents in the afternoon. Open House at Delphi Academy is a family-friendly affair with classrooms open to visiting families. Meet teachers and students who can answer your questions and share their Delphi experience. View the curriculum and materials, explore our beautiful campus and get to know our faculty and philosophy. Open House dates are all on Saturdays. Join us from 1:00 – 3:00 pm on campus. Light refreshments are served and children are welcome. We look forward to meeting you! © 2018 Delphi Academy of Campbell. All Rights Reserved.